The Academy meets every Tuesday, Thursday, and Saturday. Academy hours on Tuesday and Thursdays are 5 p.m. to 10:15 p.m. Academy hours on Saturdays are 7 a.m. to 5 p.m. These times include physical training. There may be days when Academy hours are extended. 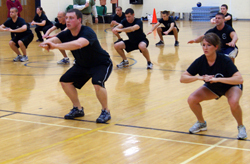 Several blocks of instruction require cadets to attend classes either several days in a row or several full daytime sessions in addition to the regularly scheduled classes. Some of the aforementioned training sessions may be off-site, which will require the cadet to have his or her own transportation. It is mandatory for the cadets to attend all sessions.